In this video we will discuss how to implement sorting in AngularJS. This is continuation to Part 8. Please watch Part 8 from AngularJS tutorial for beginners before proceeding. Example : ng-repeat="employee in employees | orderBy:'salary':false"
Example : ng-repeat="employee in employees | orderBy:'+salary'"
Let us understand sorting data with an example. Script.js : The controller function builds the model. Also sortColumn property is added to the $scope object. Notice sortColumn property is initialized to name. This ensures that the data is sorted by name column in ascending order, when the form first loads. HtmlPage1.html : The select element, has the list of columns by which the data should be sorted. + and - symbols control the sort direction. 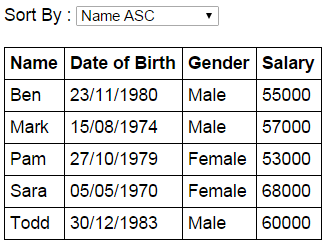 When the form initially loads notice that the data is sorted by name column in ascending order, and name option is automatically selected in the select element. Notice the orderBy filter is using the sortColumn property that is attached to the $scope object. When the selection in the select element changes, the sortColumn property of the $scope object will be updated automatically with the selected value, and in turn the updated value is used by the orderBy filter to sort the data.